One day, and maybe not too far off in the distant future, you will be bragging about how you lived in the time of Willie Nelson. Whether you’re an oldtimer and remember buying Red Headed Stranger or Wanted: The Outlaws new on vinyl, or you discovered Willie in your college years as a back catalog artist listening to “On The Road Again,” you lived on Planet Earth at the same time as Willie Nelson. You saw him live, you bought his records the day they were released. And future generations will look upon you with a bit of wonder, and envy. Willie Nelson didn’t just live through The Depression and the time of Bob Wills, he played with Bob Wills. He played in the band of Ray Price, and hung out with Patsy Cline. But no matter what age you might be, no matter when or where you first heard him, years from now when marijuana is legal across the land, and all the true legends of country music are a long time gone, you will always be able to boast of being a soul that lived during the Age of Willie. It is no longer a matter of “if” for Willie, but “when.” He’s now 84-years-old, and if there is any parting gifts bestowed to the very old, it is that life slowly relinquishes the fear of dying, and replaces it with the appreciation for life, and the wisdom that everyone must eventually move on, and that’s okay. 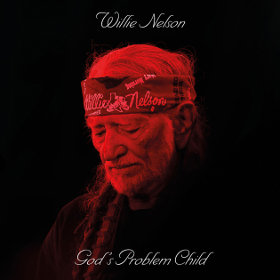 God’s Problem Child finds Willie Nelson pondering on those final stages of life like never before, and finding the peace within himself to convey to others the virtues of this time through the gift of songwriting. Since Willie launched this current era of output with Sony’s Legacy Recordings, there have been two types of Willie Nelson albums; the first being projects that consist mostly of cover songs, many times just as much traditional pop and early jazz as country. These releases all have their moments, and as a Willie fan, you put a brave face on and say, “Oh, a seventh studio version of ‘Nuages,'” and listen anyway because it’s Willie. Then there are the albums with more originally-oriented material. And though we all well up with nostalgia whenever you hear those unmistakable cadences in Willie’s voice, or the woody, nylon string tone of Trigger, and the lonesome moan of Mickey Raphael’s harmonica, the material itself on these newer Willie Nelson original releases does not solely rely on Willie’s history to be worth hearing. These albums constitute a brilliant, and relevant contribution to the listening public beyond leaning on legacy for importance and attention. And God’s Problem Child is no different. Willie Nelson has always been one to defy his nature. His performing career didn’t take off until he was nearly 40. His youthful indiscretions were replaced by his transformation into an iconic health nut. Willie has stated that he wants to die on stage, and that very well may happen. But there’s something about Willie’s aura that makes you believe he will live forever. That’s why it’s a little strange to hear him pondering on the next stage of life, and singing about losing faculties like on “Old Timer” about coming to grips with one’s own age, or the slow and reflecting “It Gets Easier” about breaking commitments as opposed to defying odds to keep them. Even “Butterfly” from God’s Problem Child seems to be about trying to capture something later in life that always remains elusive. “Little House on the Hill” is written by Willie Nelson producer and co-writer Buddy Cannon’s 92-year-old mom, Lyndel Rhodes. You can’t help wondering how much nepotism played a role in this selection, especially when you see that Willie Nelson can’t get a new song published these days without Cannon’s name getting co-writing credits (which seems to be the new “Third For A Word” rule for producers on the Row). But the song works on this record, even if one interpretation can be taken as a spiritual, and one that seems to be pondering life’s final journey once again. There are also political sentiments, though subtle and universal in message, like “Delete and Fast Forward,” or the slyly-written “I Made A Mistake” about how it’s okay to fail or lie, as long as one eventually fesses up to it. God’s Problem Child is also blessed with some good song structures and chording, which Buddy Cannon probably deserves some credit for. Sometimes Willie’s songs take the same basic approach as his previous material. “Still Not Dead” is somewhat guilty of that. But on numerous occasions, where these songs go sonically surprises you a little bit, exploring new chord changes that help freshen Willie’s approach to country music. But the hard truth is that Willie won’t be around forever. As one of the most wise souls left on the entire planet, nobody knows this better than Willie. And so we’re going to get through the final stages of his life—which hopefully includes many more years and much more music—the same way we got through the first stages of life on Planet Earth with Willie: relying on his music to bring us the wisdom to work through the hard times, the joy to celebrate the good times, and end up as better people for listening to the careful musings and lesson that only a Willie Nelson song can convey. Great review for a very strong album from the living legend. I actually think this is probably his best solo album, start to finish, in the last 15-20 years or so. When Willie passes the final nail in the coffin of great american music will be hammered in. Few artists are as iconic as him. Just as when the Hag and Bowie died I will spend the day listening to his music. We will most likely never see his like again. Thank You to all my Radio Heroes both Country and Rock for the great music. This album should be nominated for a Grammy. That cover only looks so great with the red on black, sure it looks like it will sound. The 2 songs are grand, thanks for putting them up. Willie is such a special legend, he almost sings with everyone, the older, the younger, one or 2 or 3 generations younger, he makes everything sound great. The song he did with Merle “Everything’s Goin’ To Pot” love that one too. Furthermore looking forward to the song he will sing with Steve Earle “So You Wanna Be An Outlaw”, and his most recent here “God’s Problem Child” is on my wish list as well. I think I just copy that post and post it here again. And add: Thanks for a great article Trigger. I listened to his newest album, “God’s Problem Child”, on NPR. And I thought he sounded good for someone who’ll soon turn 84. But I wonder for how much longer he’ll be around. It’ll be a sad day then he passes away and the end of an era. A mighty fine album. I received my copy on Friday and have been spinning it constantly. Willie is in fine voice, as is his guitar playing. Nearly every song is a treasure to listen to… overall, I love this album and hope it won’t be his last. I’ve been a Willie Nelson fan ever since Red Headed Stranger. My parents, though they’re fond of country music (amongst many other types), have never been fond of Willie Nelson. “He can’t sing” says my Mother. I really do not care, and I can relate to the sentiment for Willie in this review. I’m going to see him in Rogers, AR on July 6th; he’s bringing Jason Isbell (!) with him, along with Lukas Nelson, Sheryl Crow and Margo Price. I’m likely taking the next day off work as I live a fair way away from Rogers. But if the Good Lord’s willing and the creeks don’t rise, I’ll be able to tell my kids I got to see Willie Nelson in the flesh, which isn’t something I can say for many legends whose music I enjoy. I very much like this album, though I think the aesthetic of mortality slightly boosts some of the songs (though not much — they’re still good on its own merits!). Nothing will ever touch his pitch perfect ’70s/80s albums or their place in the country music lexicon, but there’s something special about a late-period album from a legend. They’re not all winners, but every now and then you get one (or a few) that actually add something concrete to a seemingly insurmountable legacy. Don Williams’ last two records hit that sweet spot for me, among others; Willie’s last few albums have as well. Few things fill me with such warmth as hearing an old audio friend like Willie exit my speakers once again. While he’s never had a great voice and it’s a bit worn these days, the wisdom and ambiance imparted is what I’m paying attention to. You listen to Willie for Willie, and that’s something very few artists have achieved within their fans, I’d say. Great album from Willie. I’ve been listening to it and Jason Eady’s new album interchangeably for a couple days now, love em both. You sir, have great tastes. I’m doing exactly the same rotation, mixed in every soften with a bit of Sunny Sweeney & Cody Jinks. All these albums are just the best that Country Music has to offer today. Holy Smokes..I just realized that all those are TEXAS Troubs! I’ll be seeing Willie for the tenth time in June. I love this man and his music. He helped get me through a very dark stage in my life and I will forever be indebted to him. Great review as always, Trigger! ready to get off work so i can go home and listen to a new record by one of our country heroes. ? Very satisfying album from the legend that is Willie Nelson.At his age he has no right to keep coming up with the goods but he’s not an ordinary man. So far this year it’s the veterans that have come up with the outstanding albums so far.Marty Stuart,Rodney Crowell and now Willie.Over to you now Steve Earle ! One of Willie’s masterpieces and for my money, will probably be one of the strongest releases of the year by anyone in any genre. His writing, playing and vocals are still as vital as ever. The dictionaries should have Willie’s picture as the definition of “wandering minstrel”. I’ve described to others his on stage performance with the Hiwaymen of “Lovin her was easier than anything I’ll ever do again” as the Master performing a masterpiece. Thanks for the thoughtful review, though surprised to see no mention that the title cut is co-written by two greats, Jamey Johnson and Tony Joe White. Was so cool to hear TJW’s voice….I may have missed it, but I haven’t heard much from him for a long time. I know I share the opinions of others when I say this, but I like Willie. 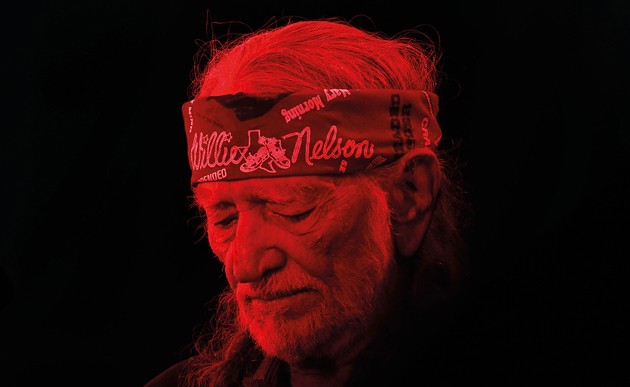 I like this album and one thing I go by in life is to not really *finish* stories–Willie seems to be going by that mantra in his own way–retirement isn’t exactly in Willie’s books because he doesn’t want to wither away alive. Touring seems to excite him and keep him going as I can tell even in person. I’ve seen interviews with Willie, and I’ve read books he wrote that explains the secrets of his lifestyle and how he can maintain a singer’s voice through and through for long periods of time and for years. Some of those secrets seem to work for me whenever I decide to sing in private or in public. I’m a journalist in my own right rather than a singer, but I don’t really publish much to the public right now which is fine. I’ve seen Willie two times and I hope to see him countless more. I hear him countless times on albums. I don’t agree with some of his politics, but that’s fine. I do like Delete and Fast Forward of the very reason of it not being overly discriminate about wars and elections, and still can pretty much be used if the elections had opposite results. I can say, once a Willie fan, people can stay Willie fans for a long time if not eternally. Great review. I’ve only spun it once but I think its nothing short of a masterpiece from a legend. And the video for ‘He Won’t Ever Be Gone’ is chilling to me. My big take from this album is just how lucky we were to get Band of Brothers in 2014. I said at the time, there’s no way I ever expected an album of that substance and focus from Willie at that stage in his career. Band of Brothers is an excellent album. With that said, this is the kind of output I expect from an aging legend. It’s reflective and emotional; a little scattered. I’m not a fan of the production – feels glossy and more Adult Contemporary than Outlaw country (A Woman’s Love could be a Michael Bolton song from the 90s). But, it’s still a Willie Nelson album and it feels like my favorite hoody on a fall day. I agree Band of Brothers was excellent. I also love the new album. I have been playing the hell out of it. 2 great albums from a legend at the end of his career. Most artists do not get to do that at this stage of their career. Johnny Cash turned great albums at the end too. Who else did? If this is to be Willie’s parting shot, let the record show that the man had great aim, right up until the end. This is also his most consistently good decade, musically, since the ’70’s. I’ll have to give this one a listen here soon. One of things I like most about Willie is his guitar playing. For his next album I think it would be a cool concept to pick some simple old cowboy songs, add some guitar solos, strip it down and really let Trigger be the star…if anyone here knows Willie please pass this along! I’ve thought on occasion he should do an instrumental album. His guitar playing is a big reason I enjoy his music. One of his renditions of “Midnight Rider” I swear the guitar is talking. bring back the short instrumental song! Yes and that was one of the things I enjoyed about the Marty Stuart album that just came out. It really helped the overall feel of the album. I picture a similar concept for Willie except more of the wise old cowboy sitting around a campfire somewhere in west Texas playing simple songs with just his guitar and maybe some tasteful Mickey Raphael harmonica. The first time I saw Willie was in the late 60’s at a venue in downtown Houston called “The Fireman’s Parade of Stars”. He did a good job (best I recall) but nothing really moving. Next time I saw him was at the Chilympiad in San Marcos in the mid 70’s. That was a great show. Funny thing is no one recognized him when he first got on stage. He was dressed in overalls and wore a train conductors cap. When he took the cap off and his hair fell down the crowd went crazy. He stayed on stage when the band took a break and played guitar for a young lady who wasn’t part of the show but wanted to sing….. that made me a Willie fan for life. True of both the man and his music. OH SWEET JESUS FINALLY PEOPLE UNDERSTAND!!!!!!!!!!!! This is what I want!!! I’m so sick of these people my age talking about their stupid problems and their one-dimensional lives!! I’ve been saying this since “A Horse Called Music” came out. These older singers have a life experience to them that makes their voices better even if tonally they went downhill. it’s a worldly wisdom that doesn’t “sound” in the sense that you can’t hear it in the music but you can feel it in their voices. “Live this long” from Django and Jimmie was just steeped in this intangible feeling that I’m not sure what it is but so many young singers never get it. Porter Wagoner and Don Williams and Johnny Cash for instance all three of them released the records I liked most later in their careers. BUT every time I bring this up I get shouted down in the comments because Hank Williams was in his twenties when he got famous. Nobody cares that was a long time ago he grew up faster and was a unique soul anyway. THIS is just so much what I want in music and thank God in heaven he saw fit that Willie and me shared some oxygen I mean shoot we might even have shared molecules at some point if his piss ran into the water supply evaporated and rained anywhere near where I might have stopped at a drinking fountain. Let the record show Willie has the best taste of country music in the business. Something for everyone. Finally listened to this whole album This is a great album. This must be a struggle to try and critique and rate. Nothing bad to say at all about it. Guitar playing is fabulous on this. Willie is just like fine wine.. I kinda equate him in the same vein as Jeff Beck as a musician. Always seems to be moving forward, keeping their integrity, doing what they want, exploring all areas that might interest them. Never will be a nostalgia act. I love this album. Buddy Cannon is doing some of the best production work of his career lately. Buddy is also a funny as hell storyteller listening to him on Sirius XM’s album release broadcast.